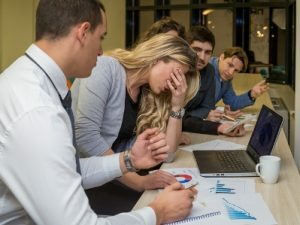 If you’ve been lucky enough to already go through a Five Behaviors of a Cohesive Team training, you know that the topics discussed touched on many more issues than you could address in the time frame allowed. If you’ve facilitated the Five Behaviors program you probably had to let some very interesting comments pass without asking for further reflection. Using this journal can help participants go deeper into the rich topics of Trust, Conflict, Commitment, Accountability, and Results. It’s a space in which to safely consider how to move from where you are to where you want to be. The Journal can be provided to participants before a Five Behaviors session. 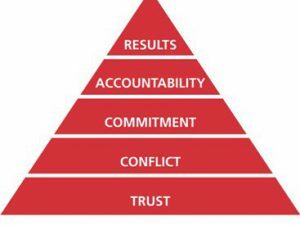 This can be helpful if the team has low trust. Putting thoughts down on paper first can make it easier to speak them aloud later. The Journal can also be given during or after a session to keep people working on the task of becoming more cohesive. Facilitators might suggest additional questions based on what they know about the teams with which they work. Journaling is more than a great excuse to buy a new notebook and pen. A journal provides a dedicated space for the discipline of reflection. The questions posed in our Five Behaviors Journal give you a place to begin and to focus. The process of reflecting upon an experience like a Five Behaviors session or on an insight gained will make it a deeper learning experience. Reflection reinforces learning and gives space for a second look at one’s own assumptions. Journals are also a place to examine emotions. When you’ve just had a session about vulnerability or conflict, you can expect a few emotions to surface. It’s hard to give them much attentional while in a group, but writing about an emotion can make it easier to understand and channel appropriately. Staying focused on a difficult topic like conflict or accountability can be hard. The questions posed by the Journal help sustain that attention needed to gain the momentum to make changes or challenge assumptions or even policies. Focusing on the team and your role on the team will make a difference to the team’s cohesion. There is no right way to journal. It helps to set a specific time for the exercise. It helps to keep distractions to a minimum. But you don’t have to give detailed answers to the questions posed. If your thoughts take you elsewhere, you can go with them. If a question holds little meaning for you, you can skip it. For people some people who journal daily, they find that reviewing their journal entries can give them a sense of growth or show patterns of thought and behavior they might want to change or enhance. We offer this Journal in both PDF and Word versions. Facilitators can add or edit questions to the Word document if desired. It’s also offered in sections so facilitators can provide it to participants in conjunction with their Five Behavior session. 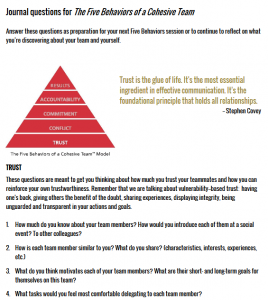 Does our team need the Five Behaviors of a Cohesive Team™?